Good Morning. I’m about to say my prayers and thank God for the exciting opportunity I have today. I GET TO DO WHITEWATER KAYAKING LESSONS! I’m so stoked! Pray that my friend Joel and I are still breathing at the end of today! I have to send a BIG SHOUT SHOUT OUT to my Mom and Dad for this, because they are paying for it for my birthday present! I don’t think I will do anything as crazy as the picture you see below, but I’d like too! 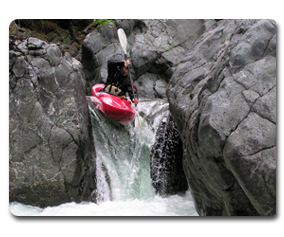 Click HERE to read a bit about Whitewater Kayaking. Have a Revolutionary day! Stay tuned for more later! you are such a dork. But I like you anyway. First of all, I was listening to the podcast because he was talking with Mark Batterson as well as Rick McKinley. Secondly, what are you against Rick Warren? I was VERY skeptical of him, but after I visited Saddleback Church, I was very impressed…they are the real deal. We should get together when you are in town, and I hope you can share at church soon, that would be cool.